Often times, Power Rangers does not get to be overly cerebral or deep in its storytelling. The series runs the gambit from funny to dramatic, but Power Rangers is usually very on the surface. That isn't the case with Fighting Spirit. 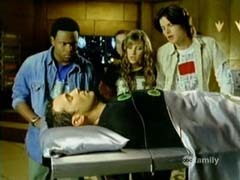 The episode starts with Tommy being accidentally put into a coma when the rangers' tech designer, Hayley, tries to make him visible again (it's a whole thing that we won't get into here.) His Dino Gem (this season's ranger power source), is used as the power source for her machine, and when the machine overloads, the gem breaks into three pieces and Tommy is left in an unconcious state. 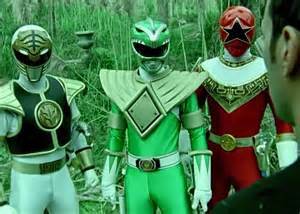 While the other rangers battle a monster who negates their powers, Tommy is made to battle 3 past versions of himself, taking the form of Zeo Ranger 5, White Ranger and Green Ranger. It is revealed toward the end of the episode that what Tommy has really been battling is his approaching death. His will to live overcame the destruction of his powers, and the gem is returned to him in tact. Receiving a new power-up, he and the other rangers are able to take down the monster. When Tommy's gem splits into 3, it actually splinters his being into 3 parts. Only by beating them is he able to restore the gem to its original form, and become whole again. That's some Kingdom Hearts stuff right there. Power Rangers being what it is, this episode is probably not as great as it could have been. For one, there is not as much tension as there should be in the hospital scenes. I don't know if this was a result of Disney, or just the writing in general, but we never really get the feeling that Tommy is in any danger. The villains are barely a factor in this episode, and that's sort of a rarity for Dino Thunder. Their only purpose is to drain the rangers' powers so they can show they're badass enough to fight without them. While that's definitely viable from a plot perspective, Mesogog is sort of left to just be "Big Evil" here, and that is usually not the case. Plus it introduces the idea of their being other power sources comparable to the Dino Gems...but we never hear from that again. Early pictures from filming of the movie show that Rita is playing mind games with the rangers here. She's not just attacking them physically, she's playing on their fears and their weaknesses; probably because she had/has those same issues. Like I said above, Power Rangers is almost always on the surface. That's fine for the TV show, but this movie has to dive just a little bit deeper into each character if it's going to be all that it can be. On this coming Monday, (March 20th), there will be a special episode of Cake Wars featuring the Power Rangers movie on Food Network. Becky G (Trini/Yellow Ranger) will be a guest judge. Check your local listings for times!